Pulse Conversion - How Does it Work & When is it Needed? 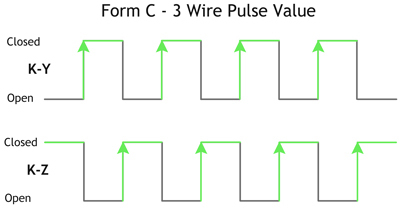 In our May Newsletter we discussed the difference between Form A (2-wire) and Form C (3-wire). But what if you come across a situation where the meter has a 2-Wire pulse output and the piece of equipment you’re connecting to the meter has a 3-Wire input? This is where Pulse Conversion can become very useful. Fortunately, it is fairly simple to convert pulses from 3-Wire to 2-Wire by just doubling the pulse constant (value per pulse). Let’s say your meter is 3-Wire and the pulse constant is 64 watt-hours per pulse. This means that every pulse transition (green arrow) is worth 64 watt-hours per pulse. See figure below. If you have a downstream piece of receiving equipment that has a 2-Wire input, it will only be capable of recording one side of the 3-Wire transition- either K-Y or K-Z. As a result, only half the amount of 64 watt-hour pulses will be “counted” by the downstream piece of equipment. (4 green arrows instead of 8) See figure below. A simple way to provide accurate readings for the downstream 2-Wire device is to double the pulse constant. Instead of using a value of 64 watt-hours per pulse, you will count them as 128 watt-hours per pulse. By doubling the pulse constant you will still produce the correct value of 512 watt-hours for the same energy used over the same period. If you can just double the pulse constant when going from 3-Wire to 2-Wire, does this mean you can divide the pulse constant when going from 2-Wire to 3-Wire? Unfortunately, no. The explanation is long and detailed, but to make a long story short, you would have to somehow magically create twice as many pulses. So what do you do if you want to accurately record pulse data with a 3-Wire piece of equipment when your meter is recording in 2-Wire? Fortunately, a simple Pulse Conversion Relay will do the trick! Our clever PCR-3PS allows the user to convert pulses from either 2-Wire to 3-Wire or visa versa while keeping the pulse constant the same. 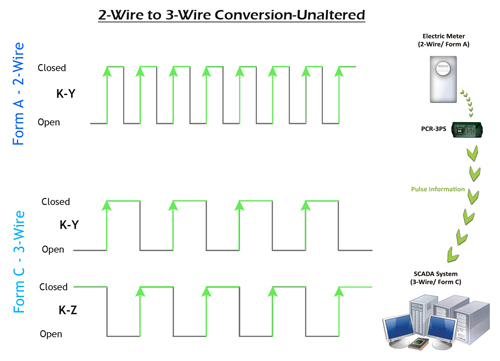 Furthermore, to make this device more flexible, the PCR-3 can be used in the “straight-thru” (non-converting) mode if a straight 2W in/2W out or 3W in/3W out isolation relay is ever needed. 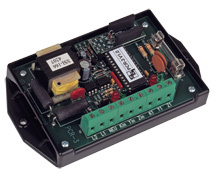 The PCR-3PS comes in handy when using energy management equipment, load recorders, or SCADA systems that have limited flexibility in programming or setting the pulse value, or in cases where a 3-Wire interface is needed but only a 2-Wire interface exists. As stated above, if there is a 3-Wire input and 2-Wire output, only one side of the transition is counted, either the K-Y or K-Z. But if you are unable to change the pulse constant due to restrictions in your equipment, simply doubling the pulse constant is no longer an option. The PCR-3PS makes it possible for the 2-Wire downstream piece of equipment to count both closures (K-Y and K-Z). The figure below shows 8 transitions on the 3-Wire input and 8 transitions on the 2-Wire output allowing for the pulse constant to remain the same. 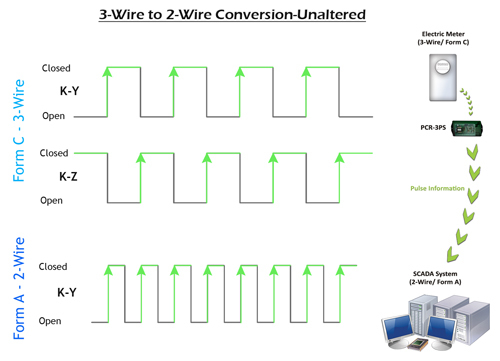 On the other hand, when converting from 2-Wire to 3-Wire mode, the situation is reversed. The 3-Wire downstream piece of equipment only counts the closure contact of the 2-Wire switch instead of both the open and close transitions. Again, note the number of edges on the figure below. There are 8 edges on the 2-Wire input and 8 edges on the 3-Wire output. Once again, the pulse value is maintained since the number of edges are the same. All this 2-Wire and 3-Wire stuff can be fairly confusing even with the simple design of a pulse. However, if you come across a situation where different Input and Output forms are being used, having a simple solution like the PCR-3PS will help you save time, money, and a big headache in the long run. Next Article: Did You Know?